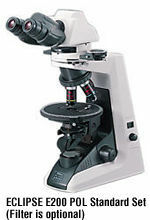 A cost-efficient polarizing microscope incorporating industry-acclaimed CFI60 infinity optics. The E200POL features an extremely compact body that takes up little space on your desk. 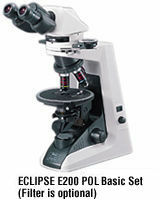 And because the E200POL's design is based on the Eclipse E200 biological microscope, it shares the same objectives and uses many of the accessories created for higher-grade Eclipse series microscopes. A 1/4 Lambda and first order red tint plate combined on one slider is available. The precision, centerable rotating stage features a vernier capable of reading to 0.1�. The intermediate tube with a Bertrand lens lets you observe conoscopic images. A daylight-type blue filter and GIF filter are available. Senarmont and quartz wedge compensators are available. Incorporating a 12V-50W lamphouse, the L-IM Epi-illuminator provides more than sufficient brightness for reflected light polarizing applications. CFI60 optics provide longer working distances and higher N.A. 's to deliver startlingly clear images at any magnification because chromatic aberrations are corrected over the entire field of view. The reversed-type quadruple nosepiece provides more space at the front of the stage to make handling of specimen slides fast and easy. E2-TB Binocular Tube or E2-TF Trinocular Tube can be selected. Their eyepoint height can be raised 34mm by simply swinging the front part of the tubes up 180�.